You won’t ever find jam in my pantry. The reason goes back to that very first year I lived on my own. I studied mostly, and I worked where I could, and my budget was incredibly tight. It looked something like this. I ate a crap ton of jam sandwiches. I packed them in brown paper bags. I had a sweet tooth, and figured there was fruit in the jam so it must be somewhat healthy. As my budget eventually loosened up my lunches became more varied. I stopped eating jam outright. I’d overloaded to the max and I couldn’t stomach it any longer. Plus, it reminded me of my brokest days. I don’t eat jam anymore, though the day may come when I buy it again. I might even try making it – I have an overachieving guava tree and more guavas than I know what to do with, though I don’t particularly like the fruit. What do you associate with your broke days? Cold wet feet. Always had the most broken in shoes in college, including a pair of boots with holes in the heel. My feet were wet every time it snowed or rained. Never again! 2-minute noodles, cheap bulk sausages, white bread and tomatoe sauce. Still love em. Oh dear. Quite embarrassing, but one night studying quite late in college, all I had was a few slices of white bread and a jar of mayonnaise in my mini dorm fridge. I couldn’t afford to order a pizza, the dorm cafeteria was closed, no one was up to borrow food from, and my car was low on gas til the next paycheck. I was so, so hungry, and I still consider it my lowest point. To say I was broke back then would be a total understatement. With all of the debt, I’d have to say that we’re still in our “broke days.” There is money coming in, but it all goes right back out. Packaged ramen noodles, which I haven’t eaten in years. I have lived in the UK most of my life, where food is cheaper than NZ, so even in my student days I didn’t feel (too) restricted. Although whilst I have been travelling in other countries, I have lived on noodles as well as nutella smeared on bread…lol. I am living in New Zealand permanently now and I do find that certain foods are expensive…namely cheese and butter! Lol, I associate Chef Boyardee Ravioli and a bag salad with my broke days. I didn’t even buy real cheese to put on the salad. I just cut up cheese slices and added it to my salad. That was dinner. I haven’t ate Chef Boyardee in almost 9 years and I don’t have any plans to either so I hear you! Hmmm I don’t know. I guess lots of spaghetti? But I still enjoy that. For the most part, even when I was super broke, I was too unwell to do much in the food department. So I bought diet shakes at the warehouse to make them more affordable. For a while in my mid-20s, I was too tired to deal with cooking (or anything, really), so my Mom would run me up to the store and I’d just eat bread for dinner. Well, if you do make that guava jam and don’t want it, feel free to send it my way! My brokest times taste like the ready-bake rolls my university would hand out at the start of the year to be frozen and anything I could get from the reduced-to-clear section of Tesco–usually some sad carrots and questionable meat choices. When I still lived with my parents (mom & stepfather & 5 sisters & 1 stepbrother), it’s not the foods so much that I remember from being broken. It is the disgusting smell of Ivory soap. I can’t understand why anyone would want their hair to smell like it, now that they make shampoo. The foods I remember everyone but me eating are peanut butter, peanut butter and jelly sandwiches, and chicken and dumplings. 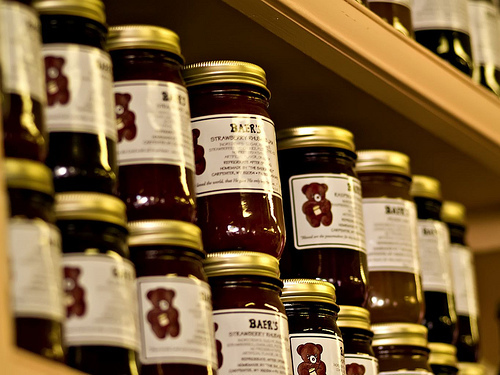 I just recently realized that I do like jam, but don’t remember eating that as a child or teen; jelly was cheaper. I still love the kid foods of PB&J and Mac & Cheese, but I ate cases and cases of Cheerios in college and I’m pretty well over those.